FFA - U.S. District Court Judge Gregory A. Presnell delayed sentencing date for Imam accused in jihad plot after CAIR testified and followers wrote letters to judge. The judge will issue his sentencing order on June 26, 2015. The email for this article was deactivate after the Judge Presnell sentenced Marcus Dwayne Robertson aka Imam Abu Taubah to 20 months prison and 3 years probation. Florida Family Association has sent out several email alerts regarding the scheduled sentencing of Marcus Robertson. Initial information indicated that Judge Presnell would rule on June 22, 2015. However, news reports and Robertson’s Facebook page indicate that June 26, 2015 is now the the sentencing date. I will not get sentenced today (June 22, 2015), the judge will be announcing his decision on Friday the 9th of RamaDaan 1436 coinciding with June 26, 2015 on the Gregorian calendar at 9:00 a.m. inshaaAllah. To sentence me separately on both counts. Regarding the firearm charge, he decided that the terrorism enhancement does not apply. He determined that I face between 10-16 months on the firearm charge. Regarding the tax charge he did not rule whether the terrorism enhancement applies or not. However, he did determine that if it did not apply I was only facing 6 months probation for the tax violation. But if it does apply I face up to 10 years. I say again, he did not sentence me and will render his decision on the 9th of RamaDaan when we return to court inshaaAllah. We were unable to pay the expert witness for another appearance in court so we arranged to do it by phone. That did not work out, so the judge has allowed him to send a written report. jazakumAllahu khayran to everyone who has tried to bring the witness in. Ultimately the decision comes from Allah in all affairs. I know everyone would like to see a conclusion, I would too walHamdulillah. But we have to be patient. We cannot get too happy or slacken while fighting this case. thank you all for your genuine concern and you all's physical, financial and spiritual support. RamaDaan mubaarak. Marcus Robertson, also known as Abu Taubah, allegedly trained another man, Jonathan Jimenez, about various military and jihadi extremist tactics to commit violent crimes overseas. Robertson, 46, is also accused of planning to use the false tax refunds to support an overseas terrorism movement. From mass slayings to strange attacks, these are pictures of the most bizarre and shocking crimes to happen in Florida. He was previously convicted in 2012 of illegal firearm possession and in 2014 of conspiracy to file a false income-tax-refund claim. If the judge finds Robertson was involved with terrorist activities, his sentence could increase from probation to 20 years in prison, according Robertson's attorney, Daniel Broderson. United States District Court Judge Gregory A. Presnell for the Middle District of Florida delayed sentencing after CAIR Florida leader Hassan Shibly allegedly testified and followers allegedly wrote letters to judge. The judge will issue his sentencing order on June 26, 2015. We also want to thank CAIR Florida Hassan Shibly for his commitment and testimony. May Allah reward them for their help. Click here to read the Facebook comments. The portion represented above is captured in a photo file near the end of this article. 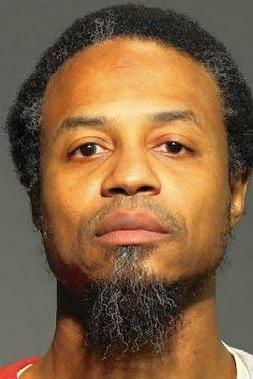 The defendant, MARCUS DWAYNE ROBERTSON, has been an extremist for many years. 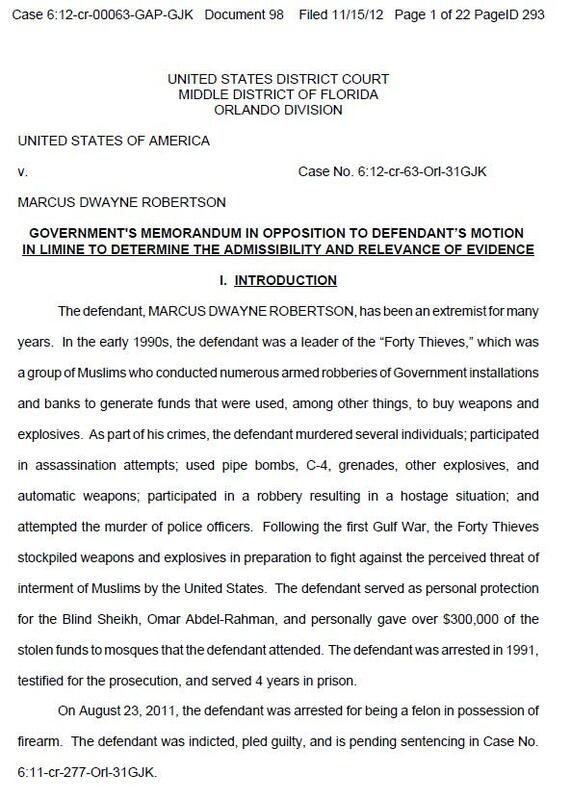 In the early 1990s, the defendant was a leader of the “Forty Thieves,” which was a group of Muslims who conducted numerous armed robberies of Government installations and banks to generate funds that were used, among other things, to buy weapons and explosives. As part of his crimes, the defendant murdered several individuals; participated in assassination attempts; used pipe bombs, C-4, grenades, other explosives, and automatic weapons; participated in a robbery resulting in a hostage situation; and attempted the murder of police officers. Following the first Gulf War, the Forty Thieves stockpiled weapons and explosives in preparation to fight against the perceived threat of interment of Muslims by the United States. The defendant served as personal protection for the Blind Sheikh, Omar Abdel-Rahman, and personally gave over $300,000 of the stolen funds to mosques that the defendant attended. The defendant was arrested in 1991, testified for the prosecution, and served 4 years in prison. The preponderance of the weight in Judge Gregory A. Presnell’s sentencing decision must be given to Robertson’s record regardless of Hassan Shibly’s testimony and Robertson supporters’ letters. The public safety of millions of Americans demands a strong sentence. Please urge Judge Presnell, for the public safety of millions of Americans, to give the maximum possible sentence to Marcus Dwayne Robertson given his serious offenses and lengthy record. 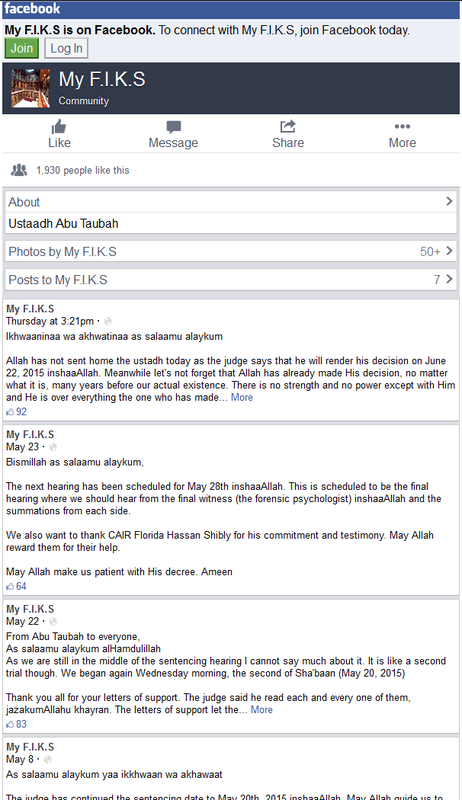 Florida Family Association has prepared an email for you to send that urges Judge Presnell to give the maximum sentence to Marcus Dwayne Robertson aka Imam Abu Taubah.